Your child's story begins before you met. It may contain a large cast of characters, perhaps a touch of mystery, and more drama in a month than many people experience in years. And it's up to you to record this story before the details begin to fade. Need more incentive? Writing a lifebook will help you find the right language to talk about adoption and birth families as your child grows, and will jump start many a conversation. Our panel of lifebook experts answer the most frequently asked questions, offering advice on the topics every lifebook should address, how to deal with difficult information, and how to get started on this important project. Read on, and write on! 1. Should parents who adopt newborns create lifebooks? What are the key topics? Beth O’Malley: There is always a role for a lifebook, and the key topics are generally the same: growing inside another lady’s tummy; growing in a special place called a uterus; being born; birth mother; birth father; birth siblings; and reason for the adoption. Domestic adopters should realize that birth family contact levels can change. If you have met your child’s birth parents, you may not see the need for a lifebook, but imagine that, years from now, your letters to them are returned with no forwarding address. You’ll wish you’d asked every question and preserved every bit of information. If you have an ongoing relationship, ask the birth mother to create some pages. If you have photos of the birth family, I suggest sharing them from day one. Speaking as an adoptee, I know that never seeing anyone genetically related to you can make you feel lonely at times. Having even one photo makes a big difference. Joni Mantell: A key topic for any lifebook is to acknowledge that, like all children, your child was born. Too often, adoption stories begin when the parents and child met, which results in some adopted children believing that they came from a plane or an adoption agency. Whether or not you have specific information about your child’s birth, it’s important to acknowledge that his birth happened. 2. Adoptive parents wonder how to begin a lifebook if they know little about their child’s birth family, about his first months, or even the exact date or location of his birth. How can they get started? Beth: I always tell families that they know more than they think they do. Begin with the few facts you have, and with universal truths. We all begin with being born. Before that, a baby grows inside his first mother’s uterus. Jennifer Demar: When little is known about a child’s birth family, talk about genetics, and how children inherit certain physical and character traits from their biological family. Try using reflective cardstock paper on a lifebook’s birth parent page. Ask the child to imagine adults who look similar to him. 3. Should parents incorporate their child’s birth family and heritage? How? Is it different when they know the birth family? Jayne Schooler: Incorporating as much information as possible about your child’s birth family achieves a number of important things. First, it sends the message that you recognize and honor your child’s birth family. It says, we validate who you are by embracing those who gave you life. Second, it captures critical information that, over time, might otherwise be lost or forgotten. Third, it creates a sense of connectedness and continuity for a child. Beth: It’s important to acknowledge your child’s birth heritage, whether the adoption was domestic or international. Parents of the same race as their child may forget to talk about heritage, but the subject is critical to a child’s development of self and identity. In international adoptions, conditions in the birth country may be part of the reason the child was “available” for adoption. Joni: It’s also important for parents to acknowledge and respect a child’s culture, to support these aspects of the child’s identity. But be careful that focus on heritage doesn’t become a way of overcompensating for or avoiding other adoption topics. Children are not born to a culture, they are born to parents. That is what their adoption story is really about, and that is what should be addressed in their lifebooks. 4. How should parents address the extreme poverty that forms the backdrop for many children’s adoptions? Jennifer: Here’s how I treated the poverty issue in my daughter’s lifebook: I made a grid and labeled four squares “food,” “clothes,” “education,” and “toys.” I explained that children need all these things to learn and grow. When her birth family realized that they could not provide these things, they made an adoption plan. This made it easy for her to understand. 5. Many parents keep paper memorabilia from their child’s early life. Should this material be incorporated? Or should a lifebook be straight narrative? Roberta Rosenberg: I believe that children will want every document, every form, every scrap of paper about themselves. Use any mementos (or copies) that will help ground the story of your child’s life before joining your family in a concrete timeline. 6. 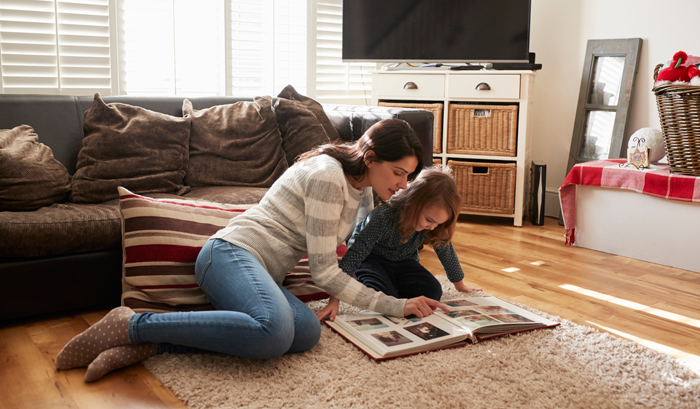 When and how often should a parent read a child’s lifebook to her? Where should it be kept? Roberta: There are no age guidelines. Read it as often as your child wants or needs to hear it. My children, 10 and almost-nine years old, still ask me to read their stories to them. We keep their lifebooks on their bedroom shelves. Beth: My daughter’s lifebook lived on our coffee table at first. As playdates and babysitters arrived, later in her life, it moved upstairs into our bedroom. Lifebooks aren’t secret, but they should be kept private, for your child to look at and share as she feels comfortable in doing. 7. Do you recommend writing your child’s story from his perspective? From yours? Roberta: Sometimes, writing in the first person is a good way to keep the story on track, and to make sure it focuses on the child’s story and not on the parents’ own narrative. Start with the idea, “Tell Me About Me,” and take it from there. 8. How should negative information be addressed—in the pages of the lifebook and in reading it to a child? Is it OK to fill in more details as he grows? Jayne: While it’s never OK to lie, omitting some details until the child is developmentally ready is appropriate. Adoption experts suggest that a youngster should know his complete history by the time he is 12 years old. By this age, extended family members often know the child’s history. A family who thinks withholding information is protecting a child’s heart is only leaving his heart vulnerable to accidental disclosure. Beth: Explanation must always be truthful and appropriate to the child’s age and memory of events. Before explaining something like abuse or addiction, my first question is, “What does the child remember?” Trauma can act as a natural eraser of memory, or it can magnify and intensify memories. For younger children, use simple explanations, such as, “Your birth mother wasn’t able to take care of herself. How could she take care of a little baby?” or “She was having grownup problems and couldn’t take care of any baby at that time.” You can never go wrong by adding, “Babies can’t cause grownup problems.” Your child shouldn’t feel responsible for her birth parents’ problems. Never tell a child that his birth mother was “sick” unless she had a physical illness. Kids hear “sick” and start worrying about all sorts of questions (that don’t always get expressed), such as, "Will I go back to her if she gets better?" or "Will I have to leave my mom if she gets sick?" Jennifer: Try the “hidden journaling” technique. Document the difficult details from the beginning but hide them away (between pages, tucked in an envelope or pocket, hidden behind a flap), until the child is ready to process them. It’s important to point out that the birth parents’ difficult circumstances resulted in your child’s relinquishment. Reinforce the fact that nothing was your child’s fault and that she should not feel responsible. 9. The page that explains the relinquishment or abandonment is often the hardest for parents to write. Can you suggest ways to explain it? Beth: If you don’t know all the details, say, “From what I know” or “It seems,” but don’t pretend to have or know information, feelings, or intentions you don’t. Jennifer Demar is the founder of scrapandtell.com, a scrapbooking and lifebook resource for adoptive families. Joni Mantell is director of the Infertility and Adoption Counseling Center and a psychotherapist specializing in adoption. Beth O’Malley, an adoptee, adoptive mom, and adoptive social worker, is the author of Lifebooks: Creating a Treasure for the Adopted Child (adoptionlifebooks.com). Roberta Rosenberg is a mom to three, through birth and adoption, and owner of adoptshoppe.com, a gift/bookshop featuring lifebooks and adoption baby books. Jayne Schooler is coauthor of Telling the Truth to Your Adopted or Foster Child: Making Sense of the Past (Bergin & Garvey). Buy a three-ring binder, with plastic page inserts, so you can add to the lifebook and rearrange pages as your child grows. Involve your child in creating the lifebook. A two- or three-year-old can choose photos and page decorations. An older child can narrate parts of her story. Duplicate everything of value—certificates, newspaper clippings, and letters—that you put in the lifebook. Store document originals and photo negatives separately. Keep the text short, and provide a visual focus, such as a photo, a drawing, or a document, on each page. Color-copy the pages of the completed lifebook and place the copies in the binder. Store the original pages in a safe place. You can end the lifebook at your child’s adoption, or keep adding to it as he grows. For more tips on creating a lifebook, sign up for Beth O’Malley’s newsletter at adoptionlifebooks.com/signup.htm, and visit adoptivefamilies.com/scrapbooks. Tips for capturing the journey leading up to your child's ..
A lifebook can fill in the gaps of your child's ..